The temple is a material record marking definite stages in the spiritual evolution of man. In fact the temple forms an important part of India's heritage. 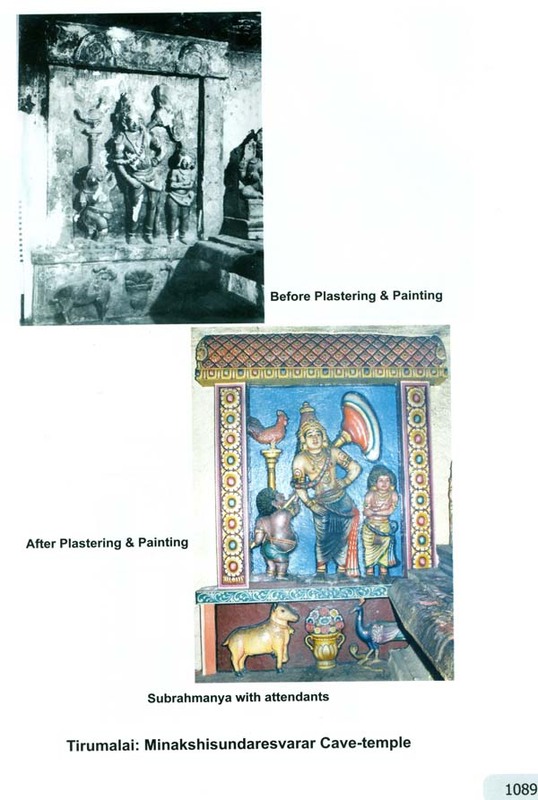 It is not an exaggeration to state that the richness of Indian culture rests upon the stable base of our temples. 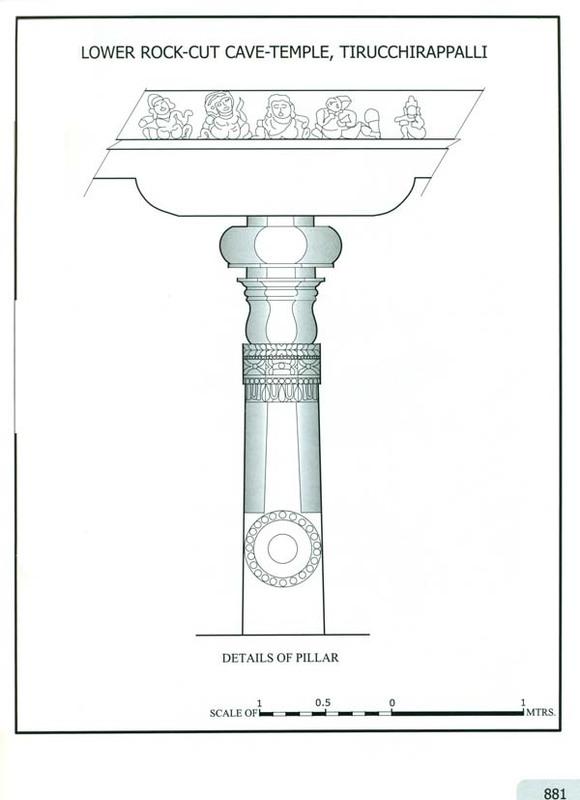 As a structure that enshrines a god or some other object of veneration, it has a varied growth in parts of the sub-continent. The vast legacy of Indian temple- architecture has engrossed the attention of large number of scholars' right from the days of the pioneering work of James Fergusson and much valuable works have already been done. 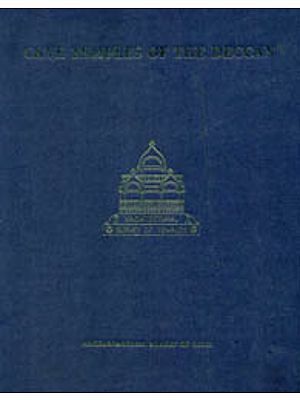 However in order to have a systematic study of the copious temples situated in different parts of our country by a more extensive fieldwork and intensive examination of each and every details of them, the Archaeological Survey of India has set up special branch namely Temple Survey Projects, one for the north and the other for the south, in 1955. The distinguished stalwart, Padmabhushan (Late) K.R. 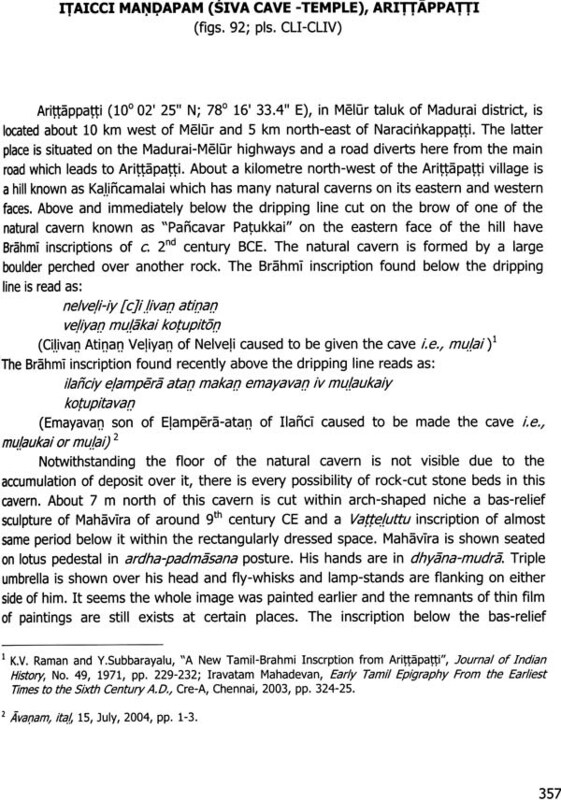 Srinivasan was posted as the first Superintending Archaeologist of the Temple Survey Project (Southern Region) and his extensive survey of the Cave-temples of the Paliavas was published as Cave-Temples of the Pallavas, No.1 of the 'Architectural Survey of Temples' series of the Archaeological Survey of India, 1964. Followed by him, many doyens like Late Dr. H. Sarkar, Late Sri KV. Soundararajan, Dr. 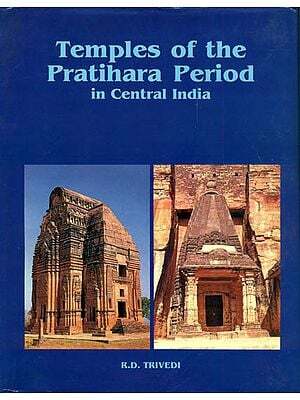 I. K. Sarma and others served in this office and made remarkable contribution in the study of temple architecture. D. Dayalan's present work on the Cave-temples in the regions of the Pandya, Muttaraiya, Atiyaman and Ay dynasties in Tamil Nadu and Kerala is in a broad sense the continuation of the work carried out by Padmabhusan Late Shri K.R. 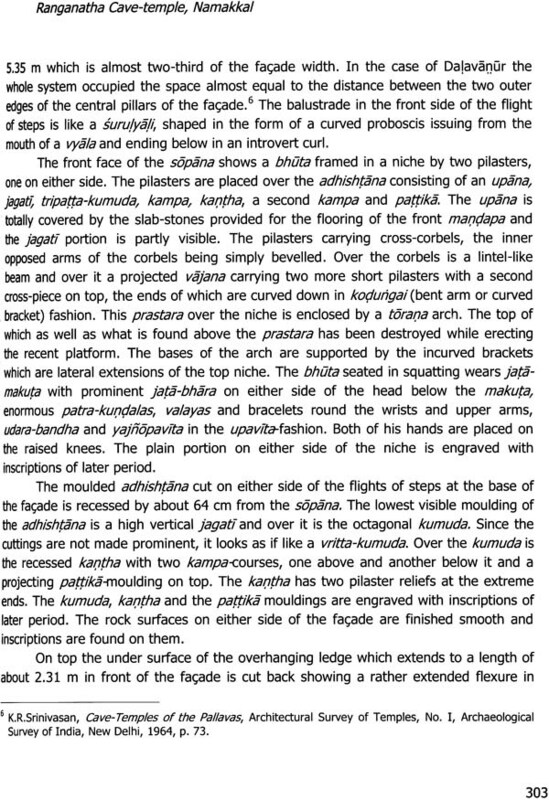 Srinivasan on the rock-cut architecture of the Pallava times. 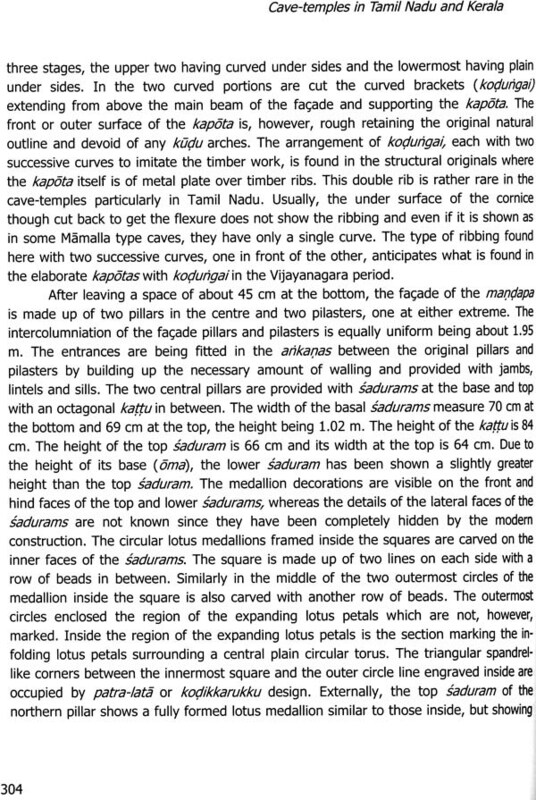 This volume is an outcome of the meticulous study of all the cave-temples in the respective regions by the author and is, in fact, a first hand and authentic documentation of the art and architectural features of the rock excavations in southern Tamil Nadu and a part of Kerala. He has made systematic analysis of all relevant aspects and also put in use the modern technologies for documentation and data collection. The author deserves to be congratulated for producing such a brilliant volume which will be useful to the specialists, the students as well as lay readers. 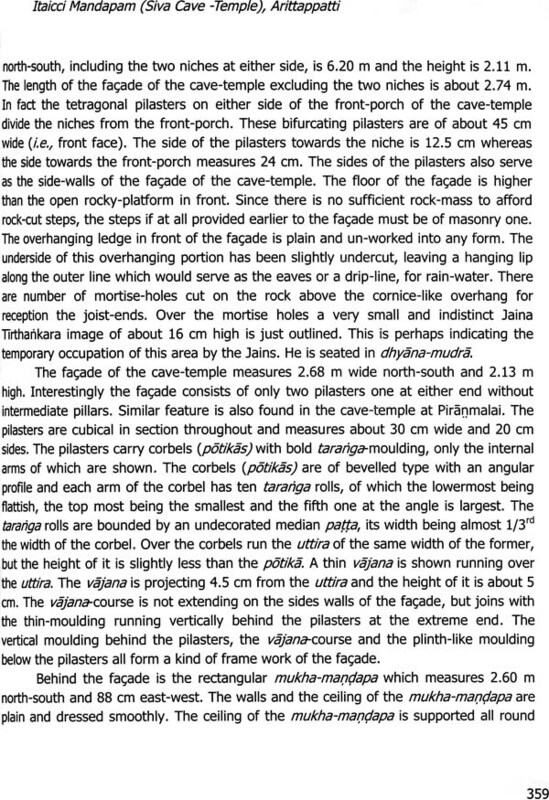 This work, which is a comprehensive survey of the entire series of the cave-temples in the regions of the Pal)Qya, Muttaraiya, Atiyamao and Ay dynasties in Tamil Nadu and Kerala, was carried out by the author on behalf of the Archaeological Survey of India, under the Temple Survey Project (Southern region) during the period between 2008 and 2011. 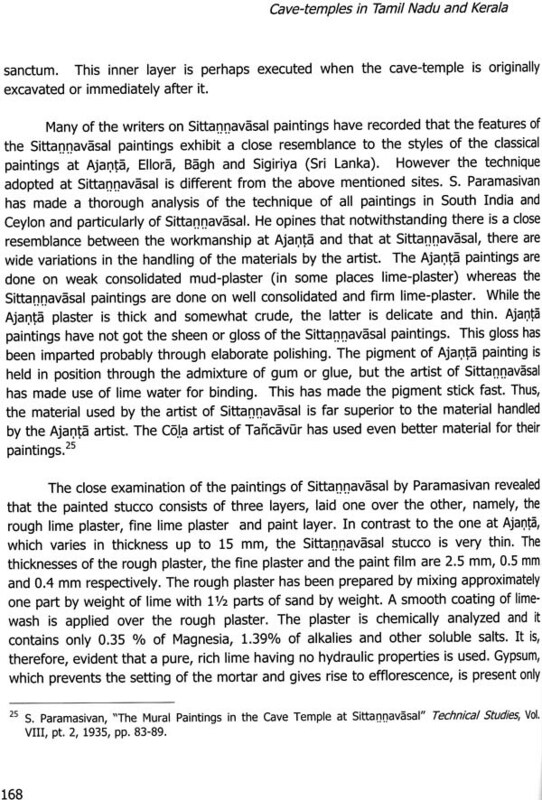 It is in a broad sense the continuation of the work carried out by Padmabhusan Late Shri K.R. 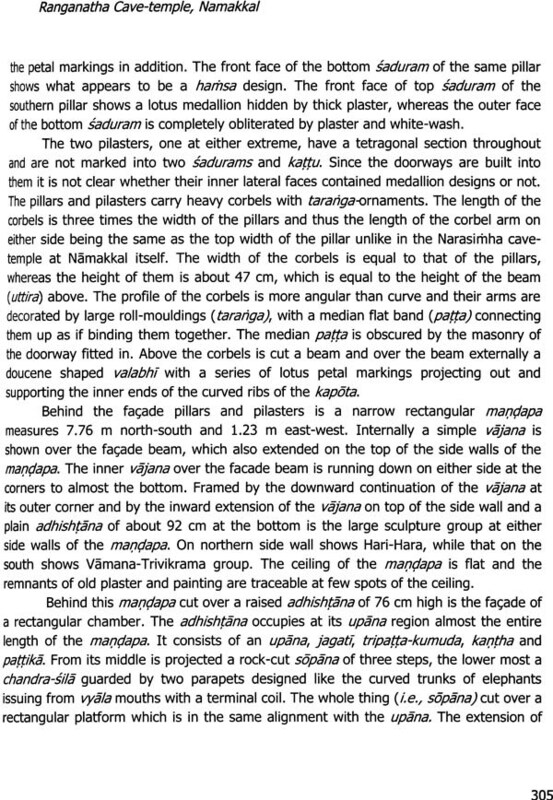 Srinivasan on the rock-cut architecture of the Pallava times (published as cave-Temples of the Pallavas, No.1 of the 'Architectural Survey of Temples' series of the Archaeological Survey of India, 1964). This work presents a onspectus of the major and minor creations of the cave-art enterprise, as fostered in the lower Tamil Nadu and a part of Kerala, in the period approximately between the 6th-7th centuries CE and 9th-10th centuries CE by various dynasties. 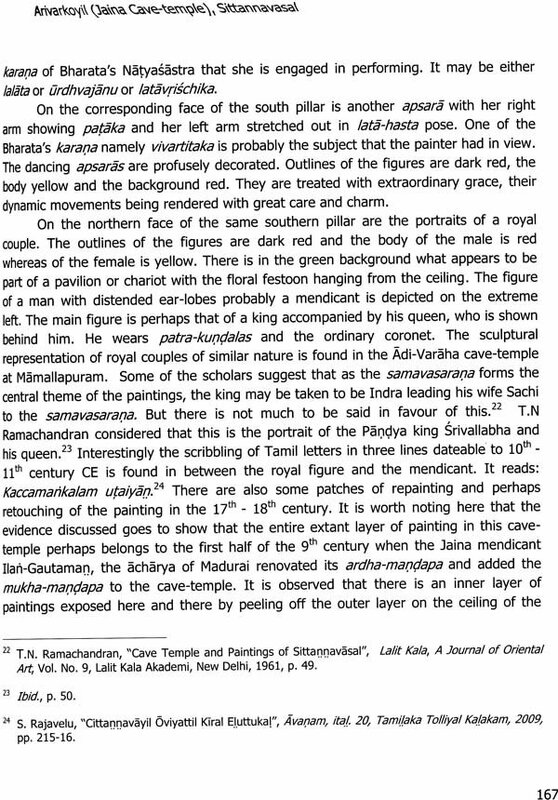 In this spectrum of early rock-cut art of lower Tamil Nadu and Kerala in which, the Pandyas had loomed large, and provided cultural equipoise with the Pallava counterpart in upper Tamil Nadu. 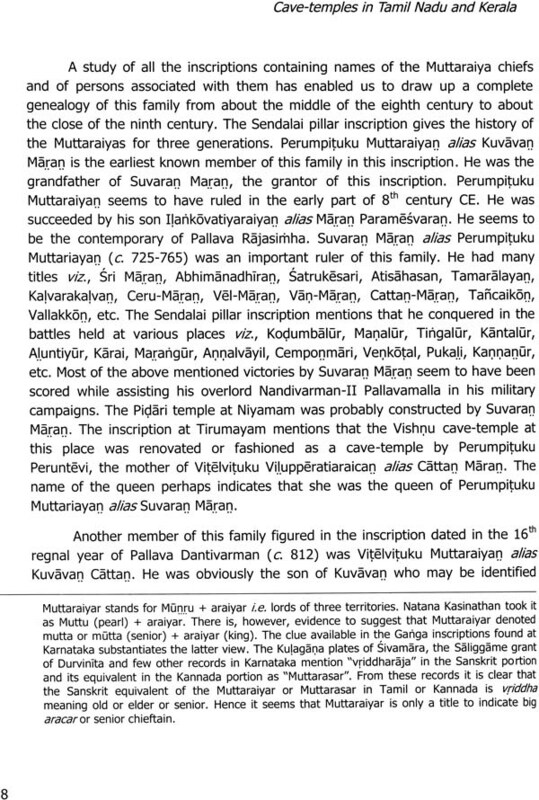 Among the minor ruling families the Atiyamans had achieved their niche of fame by just a few rock-cut temples at Namakkal and Tantonrimalai (Karur) and filled a void seen otherwise in the Kongu country of Tamil Nadu. 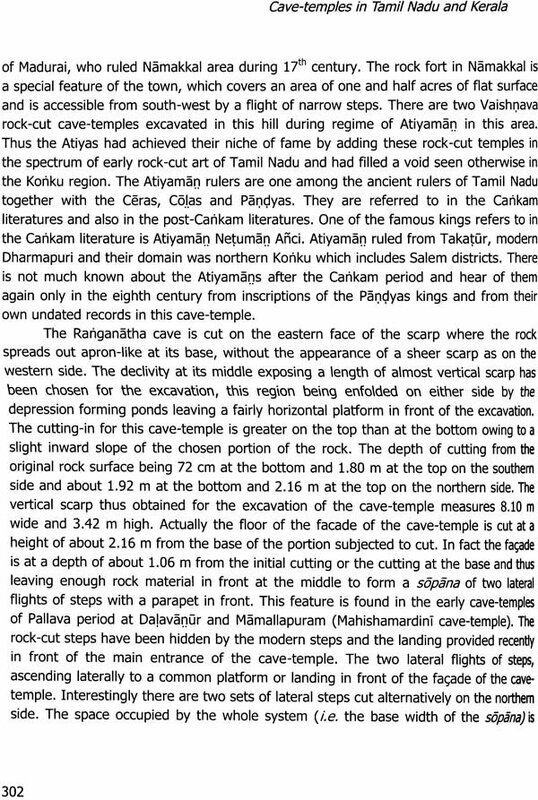 Likewise the Ays and the Ceras also made many cave-temples in the southern part of Tamil Nadu and several limited tracts of the Kerala coastal plateau and the passes. 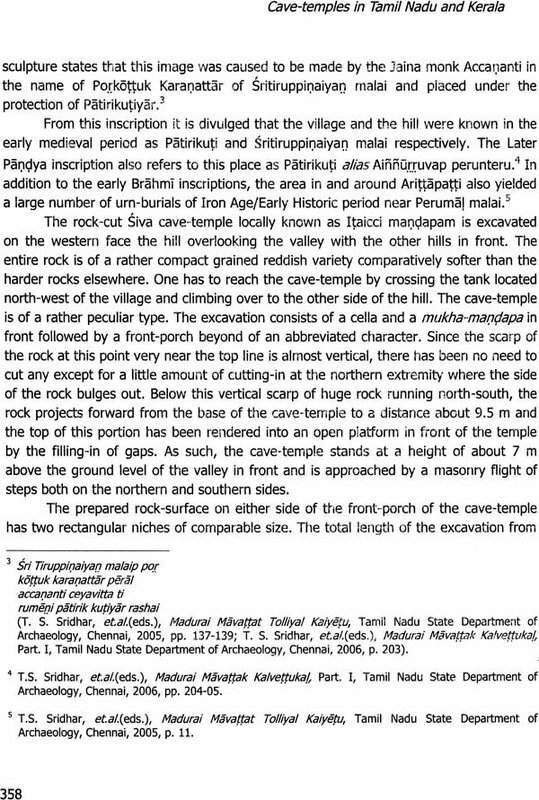 The Pudukottai area was an important nursery of the Muttaraiyas for their cave as well as stone structural temple activities. 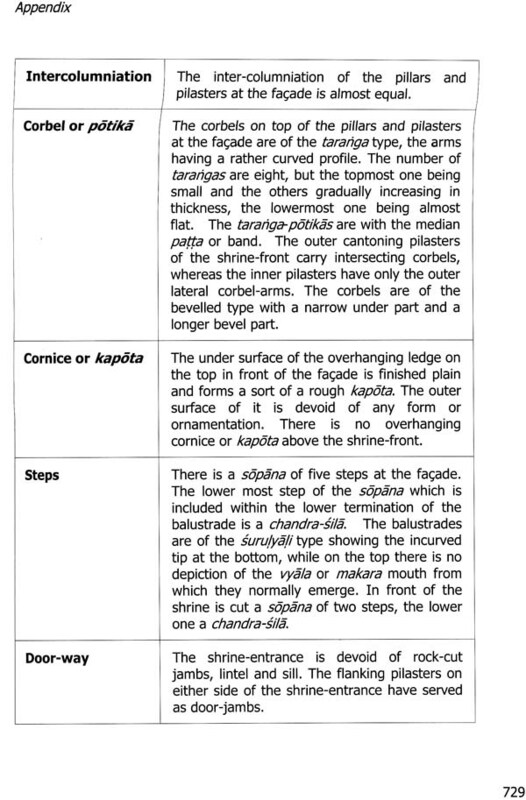 The tradition of rock-cut architecture in India developed during the Mauryan period in and around ancient Magadha. The caves excavated into the hard rock in the Barabar and Nagarjuni hills near Gaya and the outcrop at Sitamarhi near Rajagriha, all in Bihar are first of its kind in India. This, in the succeeding centuries, spread widely and resulted in the blossoming of quite a large number of rock-cut architectural centres almost all over India. 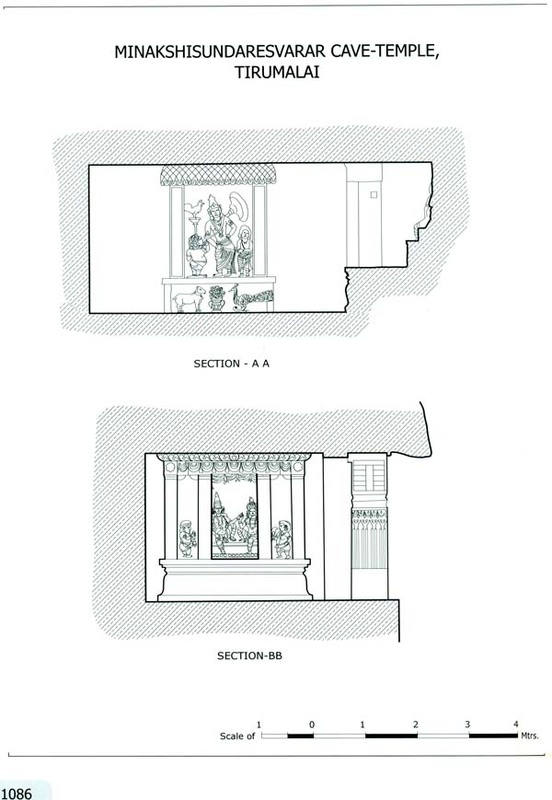 The Kadambas, Chalukyas and the Pallavas were pioneers in the translation of the contemporary brick and timber architecture of the south India into stone. 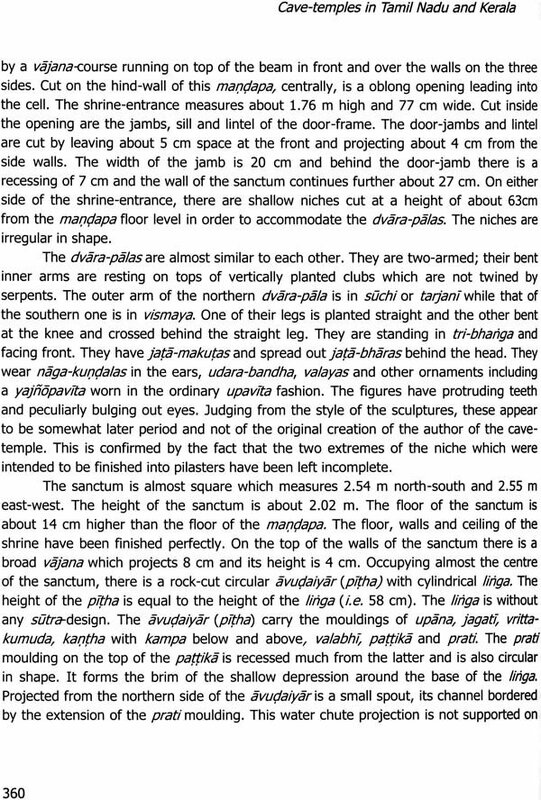 While the Chalukyas chose comparatively softer and more tractable stone in the excavation of their cave-temples, the Pallavas, Pandyas, Muttaraiyas, Ceras, Atiyamans and Ays in Tamil Nadu and Kerala tackled much hard and less tractable rocks in the excavation of their cave- temples and the carving of their monolithic models. 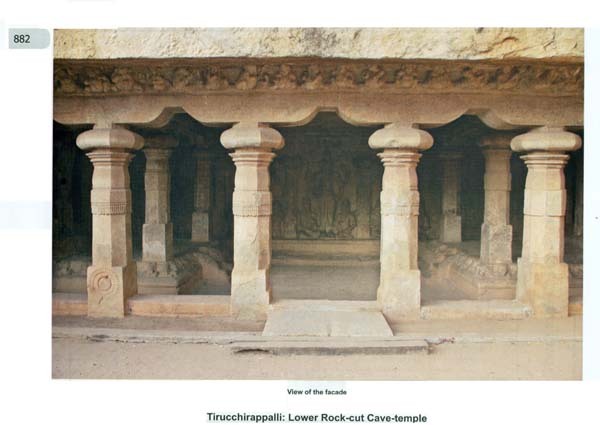 The efflorescence of this cave architecture in many centres has bequeathed one of the richest legacies in south Indian monumental art. The juxtaposed studies of those rock-cut modes have the benefit of highlighting the metamorphic variety and range inherent in various temple-building styles. The present volume is essentially a first-hand, authentic and formal documentation of the rock excavations in southern Tamil Nadu and a part of Kerala. 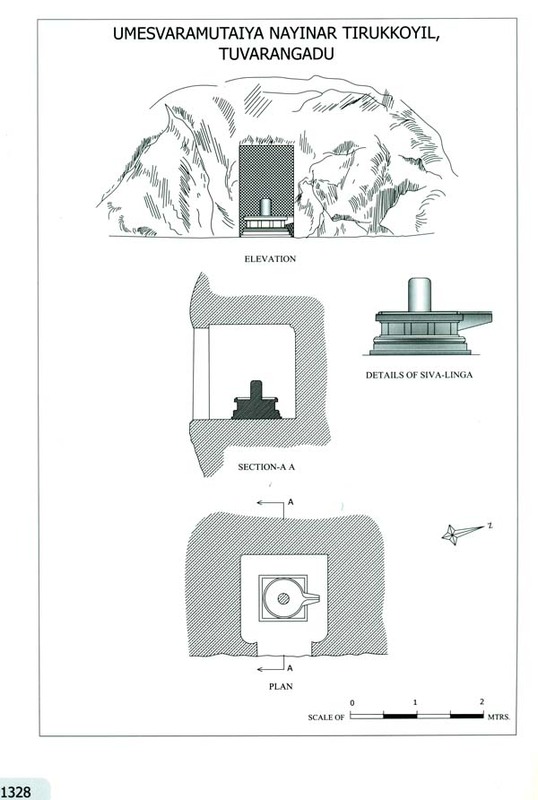 The main objectives of the present study is not only to provide an authentic documentation of the art and architectural features of the cave-temples but also to focus on the evolution, method and the technology of their production, the probable phases of work and their sequence and the time factor involved, the regional bias, iconographic and religious perspective, the inscriptions and chronological evolution of the rock-cut legacy of lower Tamil Nadu and a part of Kerala. In this work, the vivacity and the transformations, the specialties and spiritual élan of these rock-cut art are discussed which would fill a long-felt lacuna in our understanding of the craft, art, religion, cult movement and cultures of the above said regions. 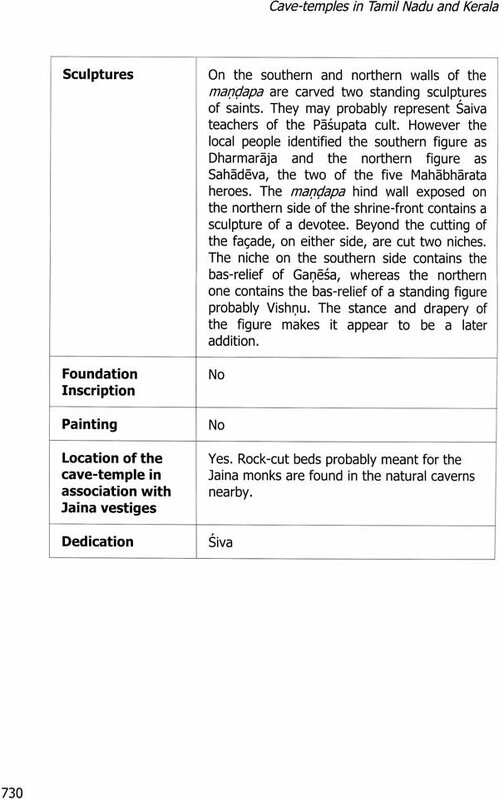 All the sites pertaining to the project are geo-registered with the help of GPS and the GIS tool has been used to store all the data of the cave-temples. The photographs and drawing have all been digitized. 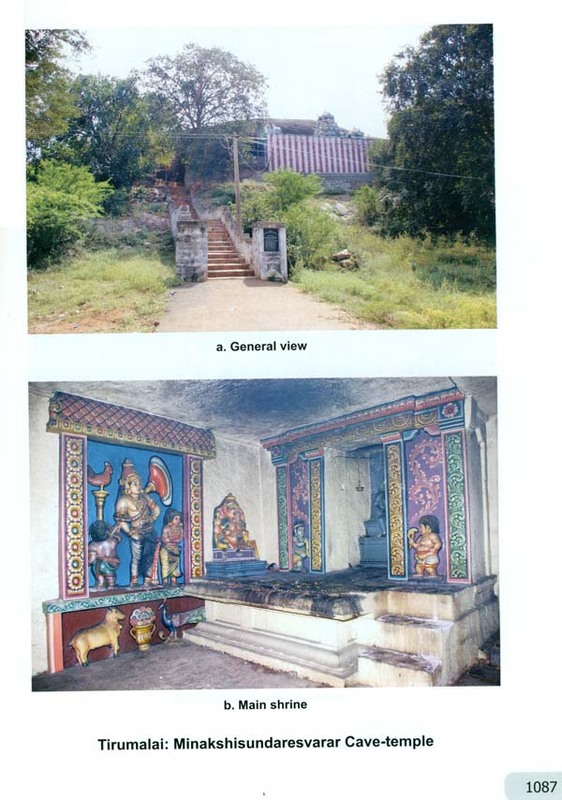 The archival materials are probed in many cases to realize the original character of some of the cave-temples which are otherwise modified or added with additional edifices completely camouflaging the original features of the cave-temples. 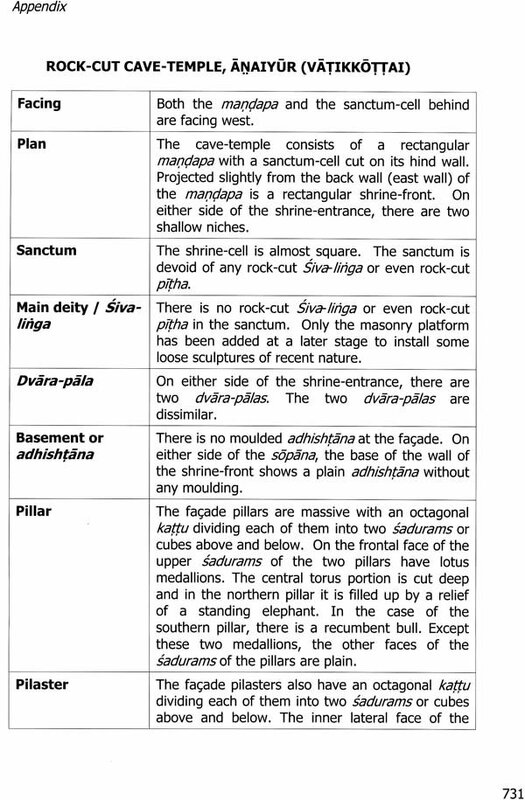 The compressed pro-forma containing the systematic summary of the salient features of the cave-temples is given at the end for ready reference and easy understanding. 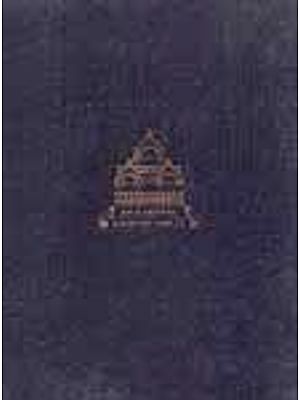 Since a volume of silpa-literature grew side by side with the growth of the temples and many contemporary inscriptions employ architectural terms, they have been appropriately used in the description of the architecture. The author records his deep sense of gratitude to Shri. 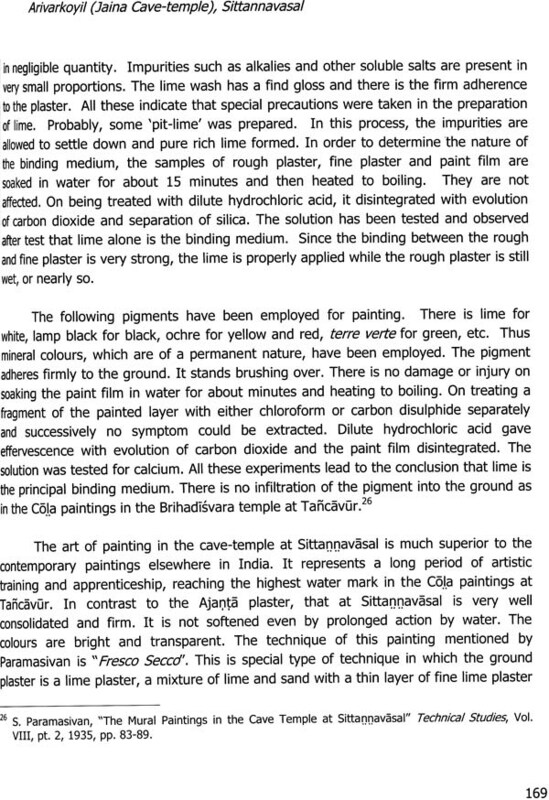 Pravin Srivastava IAS, Former Director-General for having graciously agreed to write a foreword to this book. In preparing this work the author has received help, encouragement and co-operation from a number of colleagues, friends and scholars. The author gratefully acknowledges the help and encouragement received from Prof. Y. Subbarayalu, Coimbatore; Dr. T. Sundararajan, Asst.Superintending Archaeologist (Retd); Dr. S. Rajagopal, Epigraphist (Retd) and Dr. V. Vedachalam, Archaeological Officer (Retd) at various stages of this work. The author has pleasure in recording the efforts of Shri A. Anil Kumar, Assistant Archaeologist for accompanying in the field survey and seeing through the proof. The author is thankful to Shri T.5. 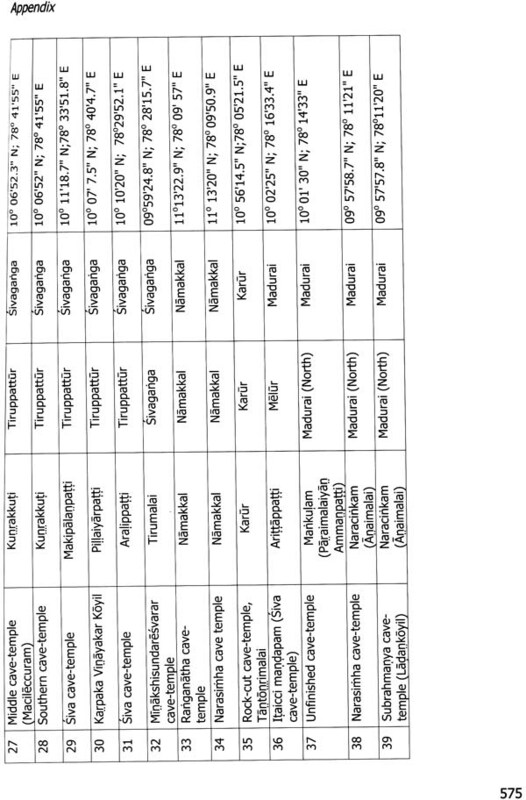 Balasubramanian, Stenographer for typing and compiling the report. Sincere and heartfelt thanks are due to Shri A. Palanivel, Senior Draughtsman and Shri K. Ravikumar, Draughtsman Grade-I for their competent labours on the line drawings and to Shri S. Ashok Kumar, Senior Photographer and Shri T. Samuel Joshuva, Photographer for the excellent illustrations. 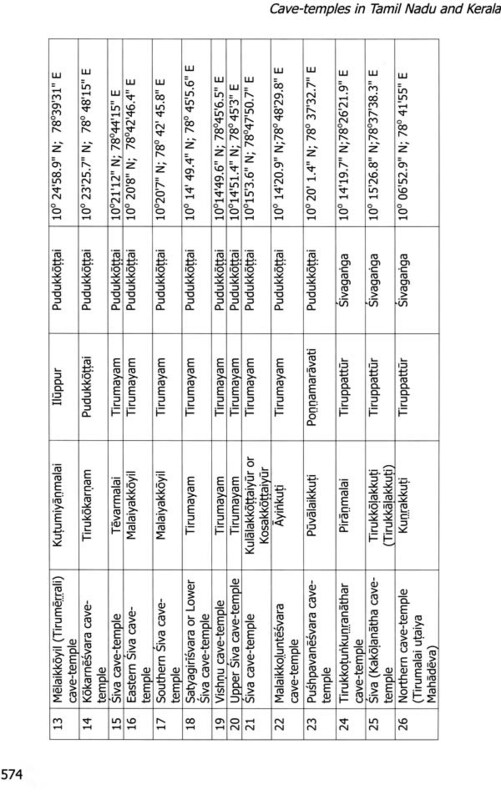 The author is extremely thankful to all other colleagues of Temple Survey Project (Southern Region), Chennai namely Smt. M. B. Suguna Krishnan, Accounts Officer, Smt. S. Mahalakshmi, Head Clerk, Smt. Y. Hymavathi, Lower Division Clerk, P. Venkatesan, Daftry and Shri B. Senthil Kumar, Shri G. Masilamani, Shri K. Sathyamoorthy and Shri S. Kumaravel for their cordial co-operation and encouragement in executing the project work. The author is indeed beholden to all of them for their ungrudging assistance. Thanks in ample measure are no less due to the Chief Commissioner, Hindu Religious & Charitable Endowment Board, Government of Tamil Nadu and the temple authorities and priests of the cave-temples for permitting to access the monuments under their control. 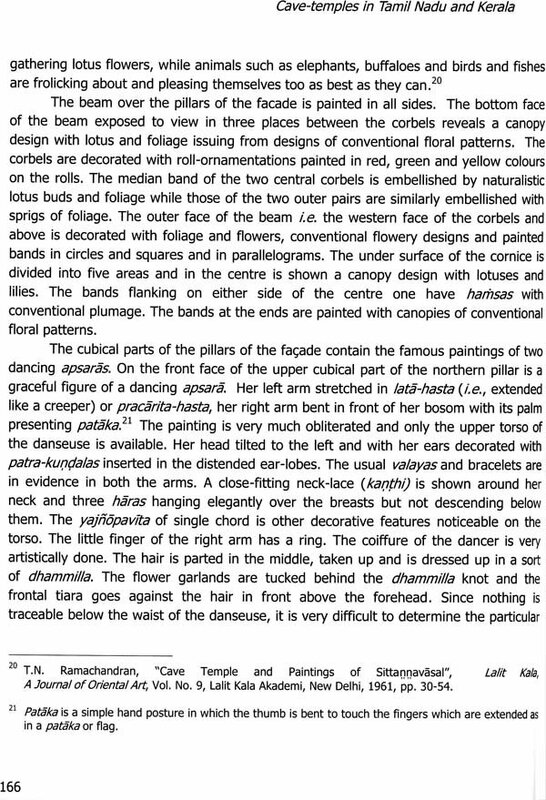 The author equally acknowledges the support and co- operation rendered by the Director, State Archaeology Department, Government of Kerala, the Superintending Archaeologists of Chennai and Trichur Circles, Deputy Superintending Epigraphist, Epigraphy Branch, Chennai and the French Institute, Puducherry. The author heartily thanks Dr. Rakesh Tiwari, Director General, Dr. B. R. Mani, Addl. Director General, Shri A.K. Sinha, Former Director (Pub) and Shri. Hosihar Singh, Production Officer, Archaeological Survey of India, for their full encouragement in bringing out this publication. 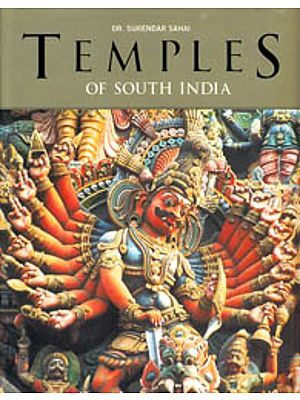 The Indian temple is the most prominent and enduring of the symbols of Indian. Tamil Nadu, one of the effervescent parts of India not only served as a cradle nurturing the temple cult, but is also the repository of hundreds of temples of different ages. The long span of art and architectural matrix of Tamil Nadu and Kerala having been fostered by various religious faiths and cross-fertilized with different art traditions blossomed in the form of kaleidoscopic temples and thrilling sculptures, all over. The earliest rigorous architectural activity in Tamil Nadu and Kerala is associated with the introduction of iron technology in this region. The kaleidoscopic varieties of megalithic monuments, which are found extensively during the Iron Age and Early Historic period, are large in number and must have required considerable time and labour for their construction. The construction of these monuments was a well organized feat of engineering and co-ordination of manpower. Several tons of stone blocks or boulders had to be cut or removed, moved to chosen building sites, erected assembled into structural arrangements. The delicate stone carving such as the part-hole and anthropomorphic figures would have required specialized craftsmen. The huge stones had been levered from one place to another by using simple engineering techniques such as wooden levers, props, earth ramps, stone supports and ropes. The stone were secured in position by means of interlocking system without using mortar. 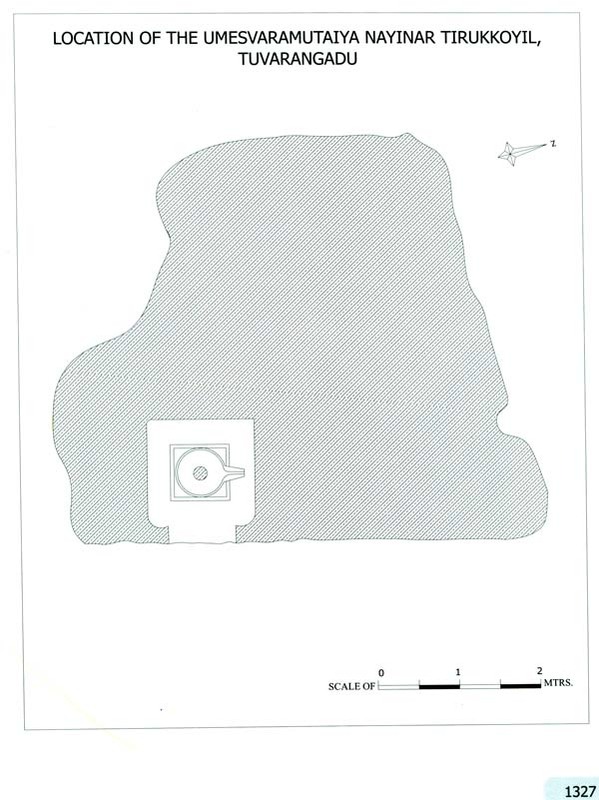 There is not much material evidence at present vouching for the existence of structures of the Cankam period. The reason may be that consistent with pan-Indian usages, perishable materials like wood and brick had been used for construction of secular as well as religious edifices in early times. However, there are a few good pen pictures in the Cankam anthology about nature and form of contemporary edifices. 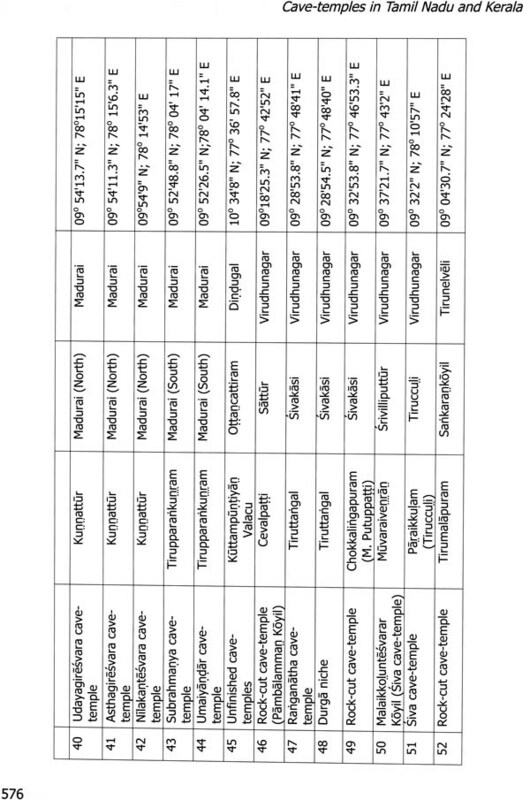 The fanes of this period are known as koyil, nagaram, kottam, ambalam, palli, tali and il whereas the secular structures are called as matam, manram, potiyil, manai, etc. After the Carikam period, the important landmark in the architectural history of Tamil Nadu and Kerala is the Pallava-Pandya period (circa sixth to ninth centuries). 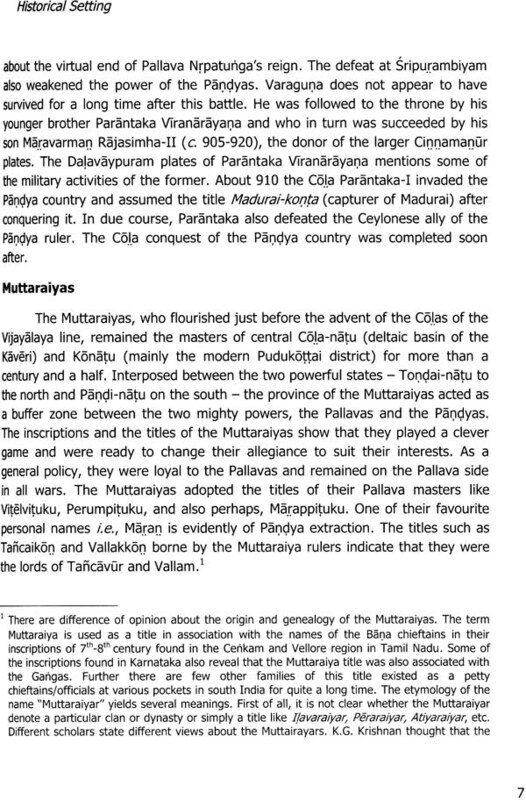 The two major dynasties, Pallavas and Pandyas as well as the contemporary minor dynasties in the buffer zones like the Muttariyars, the Atiyamans, the Irukkuvels, the Paluvettariyars, the Ays and the Ceras as well all contributed considerably to the development of art and architecture of their respective territories. 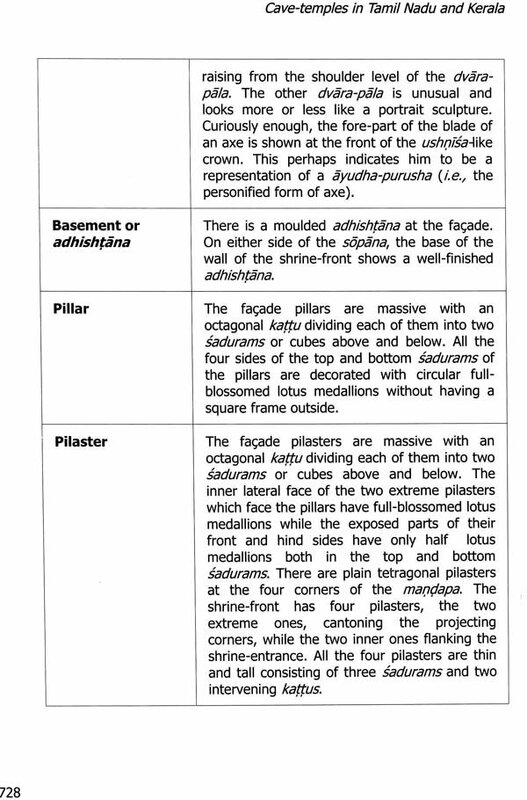 The Alvars and Nayanmars of early medieval period refer to many temple types viz. perumkoyil, Karakoyil, nalakoyil (? 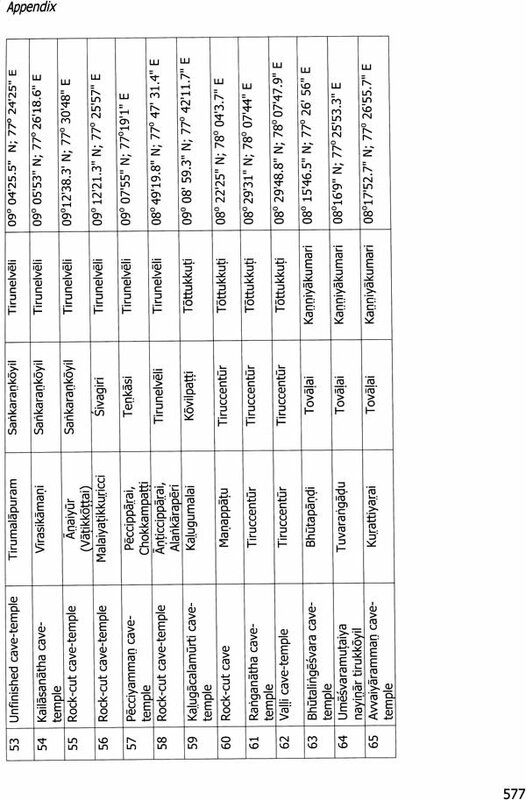 ), kokutikkoyil, ilamkoyil, manikkoyil, alakkoyil, matakkoyil, tunganaimatam, punkoyil, tirukoyil, etc. 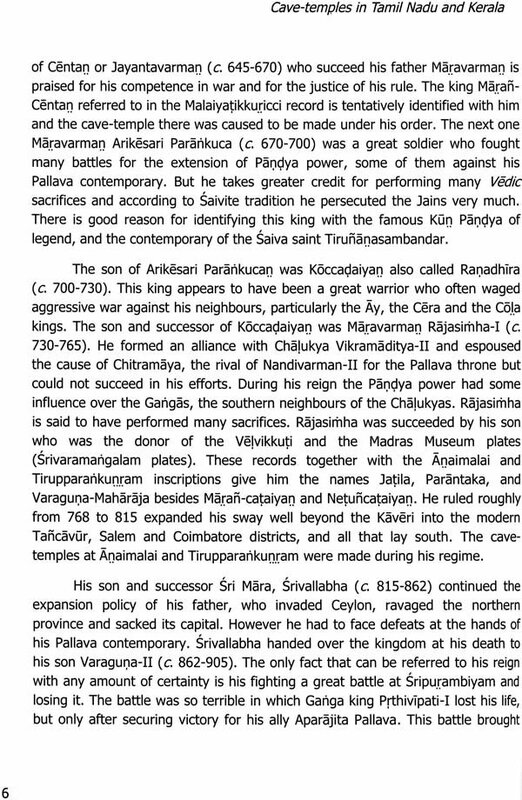 The Pallava king, Mahendravarman- I who was known as "vicitracitta" because of his curious and innovative mind, perhaps started in Tondai-mandalam (i.e., northern part of Tamil Nadu) the novel tradition of scooping out the hard rock as abode for the divinities. 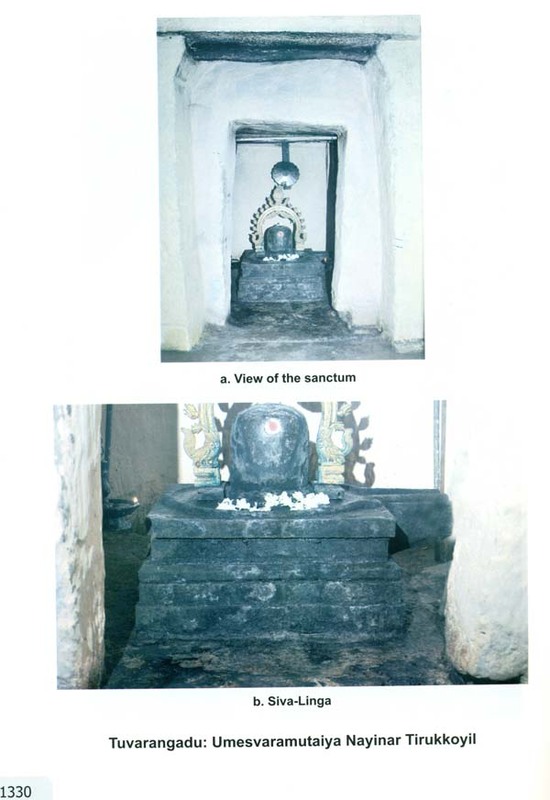 Mahendravarman boasted his architectural achievement of rock-cut temple without using timber, mortar, brick and metal in the inscription at Mandagapattu ,obviously the first cave- temple of his creation. 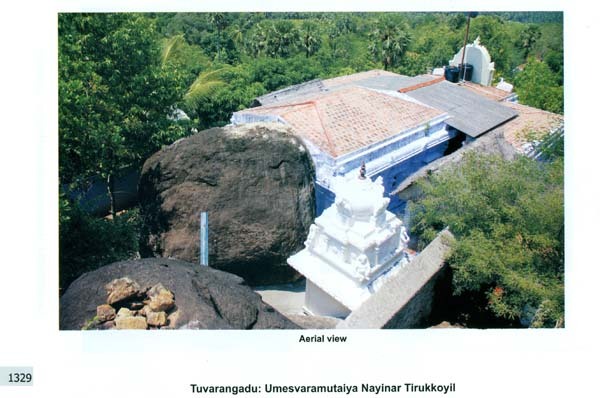 The cave architectural tradition was patronized in Tondai-mandalam only for a limited period, about two centuries, unlike in the southern part of Tamil Nadu, where it continued for a pretty long time. 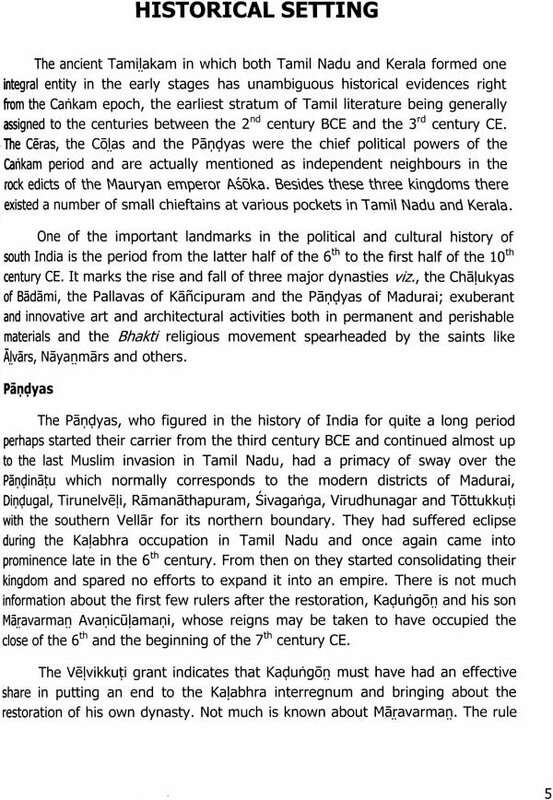 Majority of the cave-temples in the regions of the Pandyas and the other rulers in Tamil Nadu and Kerala are roughly placed between circa 600 CE and 900 CE, whereas the Pallava rock-art tradition completely vanished in the second half of 8th century itself. 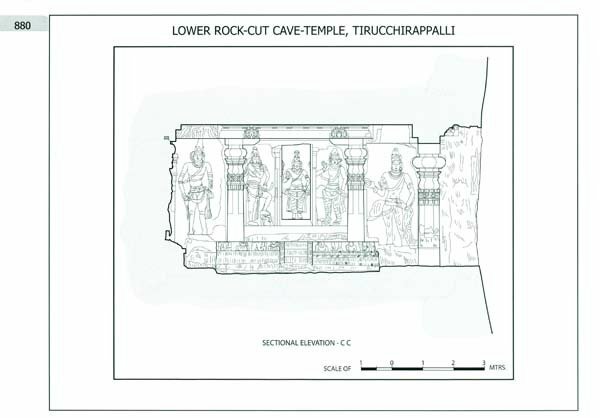 Moreover the rock-cut cave architecture in the northern part is comparatively less than in the southern part of Tamil Nadu. The rock-cut cave-temples in the regions of the Pandyas and the minor dynasties are the largest corpus of the early architectural creations in rock. Further they are widely distributed in lower Tamil Nadu, than the Pallava ones which are spread out only in limited pockets. Apart from the cave architecture, the outstanding achievement of the craftsmen under the Pallava Narashimha varman-I and his successors is the transformation of large boulders/outcrops into monolithic temples popularly known as rathas. The monolithic rathas at Mamallapuram which exhibit an excellent picture of the contemporary architectural forms are the most revolutionary architectural designing in the whole spectrum of Indian art. 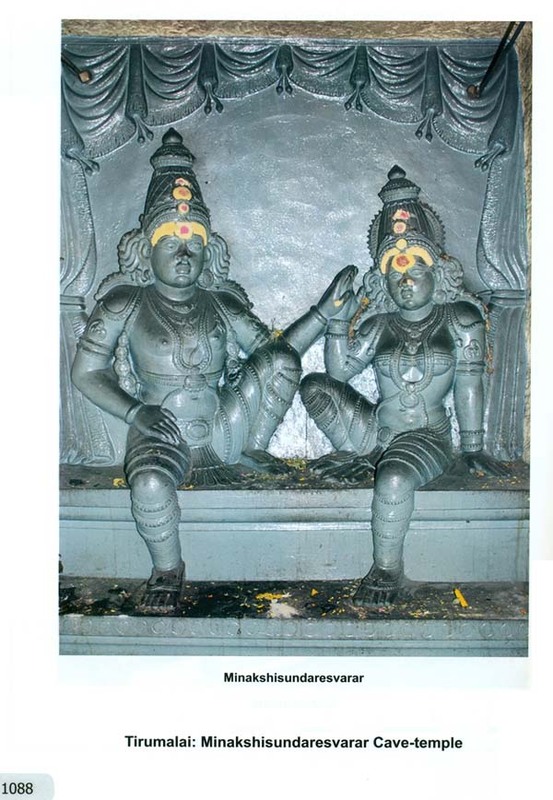 The cut-in and cut-out technique was also immediately picked up by the Pandyas whose crowning achievement was the monolithic double-storeyed Dravida vimana at Kalugumalai. 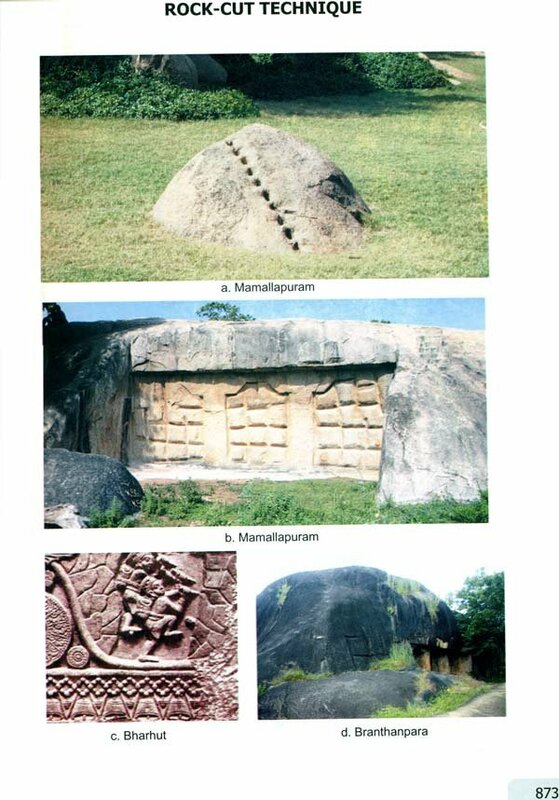 However the mode of scooping of the monolithic model at Kalugumalai, from out of a trench was quite obviously inspired by the great Kailasa monolith of the Rashtrakutas at Ellora.